The Royal Canadian Mint have launched two new coins which remember the historic settlement which was once considered the center of French power in the Atlantic region and home to one of the largest military garrisons in New France. The settlement, established during the first half of the 18th century, was the fortified port of Louisbourg on Île Royale (in modern-day Cape Breton Island, Nova Scotia). While Louisbourg’s military heritage has been widely celebrated, this strategic settlement was also one of the New World’s most important economic and cultural crossroads, and a major hub for fishing and trading ships from across the globe. The year 2013 marks the 300th anniversary of the founding of the Louisbourg settlement. After being captured by the British in 1758 and later abandoned as a military outpost in favor of Halifax, Louisbourg was declared a national historic site in 1926 and its historic structures re-built in the 1960’s to give visitors a unique experience of life in 1740’s New France. The two coins, a gold and silver issue depict scenes reminiscent of the era during the settlement’s height of importance. The reverse of the $20 silver coin which is the work of Canadian maritime artist John Horton illustrates a bustling scene of the Louisbourg shore as it would have appeared when it was one of the busiest ports on the North American continent only 40 years after it was founded. The design is enhanced by the contrast of multiple finishes and textures. The commemorative text included in the design reads “CANANDA 20 DOLLARS” above and “1713 LOUISBOURG 2013” below the primary design. The coin has a special edge lettering which reads “Louisbourg 300” and is accompanied by a repeating pattern of an anchor, fleur de lys, and maple leaf. 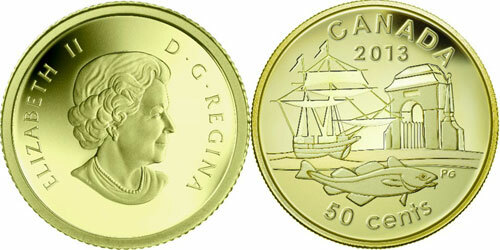 The gold coin’s reverse design includes stylized images of a cod fish, an 18th century ship and Louisbourg’s iconic Frédéric Gate that recalls the settlement’s emergence as a vital link between the Atlantic Ocean’s lucrative Grand Banks fishery and the rich waterways of the St. Lawrence. Text on the coin reads “CANADA 2013” in two lines positioned above and “50 cents” positioned towards the lower half. The design is the work of Nova Scotia artist Peter Gough. Both coins include the effigy of HM Queen Elizabeth II currently used on all Canadian coinage since 2003 and designed by Susanna Blunt. Today, the Fortress of Louisbourg, as a National Historic Site serves as both a model of world-class historic reconstruction and an enduring reminder of the essential role the settlement played in the development of Nova Scotia, and in helping to lay the foundation for the country that would one day be called Canada. For more information on these and other coins offered by the Royal Canadian Mint, please visit their website at: http://www.mint.ca/ Information offered in both English & French – International orders fulfilled.